A new study published in Current Biology found that a particularly rare kind of social behaviour known as handclasp or "high-arm" grooming takes a different form in different groups. Grooming behaviour is an important social interaction for chimpanzees which serves various functions including bonding, relaxation and defining the hierarchy. While all chimpanzees groom, only in very few groups has the handclasp grooming emerged as a behavioural phenomenon. 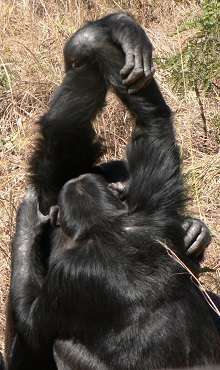 The international research team found, while studying chimpanzees in Zambia, that two of the four groups studied engaged in handclasp grooming. Moreover, these two groups substantially differed in their method of clasping: where one group clasped palms, the other group clasped wrists. Crucially, this group-specific preference was shared by the entire group, thus superseding the previous belief that this type of tradition was exclusive to family groups in chimpanzees. This indicates that, like humans, chimpanzees have the capacity and motivation to learn from each other and fine-tune their learned behaviour such that it matches with the group "norm." in manual performances – the specific styles of hand-clasping – it is hard to imagine how any genetic or environmental influences could have shaped the group-specific preferences that we observed. "Within the group chimpanzees converged on one particular variant of clasping while many were available and mastered. This indicates a certain willingness to match each other's styles. More generally, our findings suggest that the relative absence of cultural proliferation in chimpanzees compared to humans might not be caused by chimpanzees' inability to form cultural traditions, to converge on particular behavioural variants." Co-author Roger Mundry, of the Max Planck Institute for Evolutionary Anthropology in Leipzig, said: "Culture has been identified in chimpanzees in the context of tool use, but whereas tool use is highly dependent on available resources, which could differ across groups, cultural differences in social behaviour like handclasp grooming cannot be explained by environmental factors. Whereas previous research suggested that chimpanzees form traditions only within their families, we show that chimpanzees have the capacity and drive to form group-wide cultural traditions, thus transcending the boundaries of the family units." Culture among non-human animals is highly debated, and when found, it is predominantly in the use of tools. The new study shows that chimpanzees can form social traditions beyond family conventions, thereby more closely mimicking human culture than previously thought.